Materials adaptation is the process of modifying existing social and behavior change communication (SBCC) materials for a different audience, topic or setting. While this involves more than just translating the materials into the local language or modifying the artwork, adapting materials might include adjustments to the cultural context, modifications of the message or updates to the technical information. 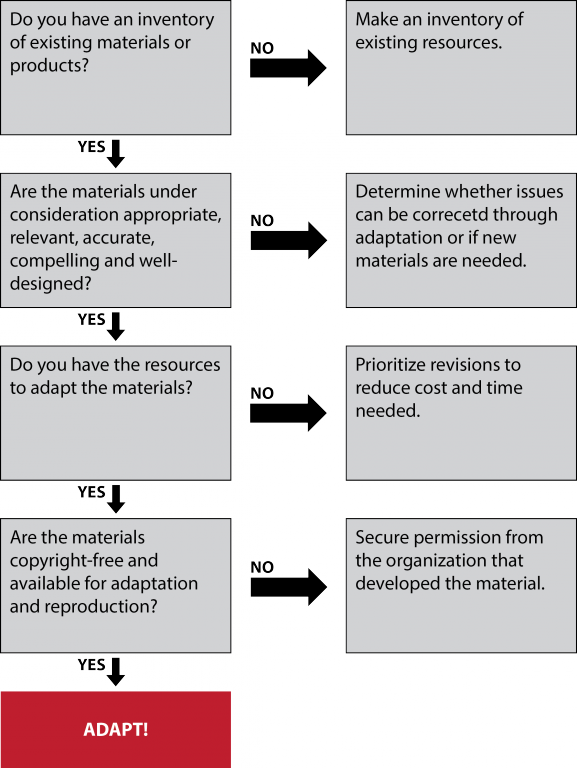 Program teams can use the adaptation flowchart for the materials adaptation process. Instead of developing new communication materials, adapting existing ones can save time and money, as well as avoid duplicating efforts. This allows high-quality pre-existing materials to be used in new contexts (with some relevant changes if needed), increasing the reach of SBCC messages. Who Should Adapt SBCC Materials? The program team (program managers, materials development specialists and content specialists) should work with stakeholders to review the existing materials. Pay attention to how they will be used and for what, and identify aspects of the materials to be revised. Once reviewed, the program team should work closely with the in-house or outsourced creative team to adapt the materials as needed. When Should SBCC Materials be Adapted? Once key messages have been developed for the priority audience, adapt existing materials or create new ones. The program team should have completed the situation analysis and audience analysis, and developed a creative brief before beginning the adaptation process. Know how to conduct an inventory of existing materials, both local and from other countries. Understand the process to obtain permission to use or adapt materials. Be able to collaborate with partners to develop adapted materials. Consider the costs involved in adaptation. Inventory existing SBCC materials and activities, pretest results, program evaluations and materials under development by partners. To identify those resources, the team can scan the Internet using Web search engines, visiting specific organization websites or SBCC resource sites [including Springboard, Health COMpass, K4Health, Comminit, Communication for Development and others]. The team can also reach out directly to partner organizations and SBCC technical working groups. The same audience and same topic (similar context/all contexts). The same audience, on different topics (similar context/all contexts). Other audiences, on the same topic (similar context/all contexts). Once SBCC materials and products are identified, analyze their adaptation potential in the context of program needs as stated in the creative brief. For each material under consideration for adaptation, determine if it is aligned with the purpose and objectives outlined in the creative brief and if it could help reach the established vision. The team should also review impact and pretesting results associated with the material to determine the effectiveness and likeability of the material. If the material meets those criteria, it is a good candidate for adaptation. At times, materials need to be adapted quickly, especially when dealing with a disaster or an emergency situation like cholera or Ebola. In this situation, see HC3’s blog post, The Art of Adaptation When Adapting Communication Materials in a Hurry, for guidance. Once the communication materials to be adapted have been identified, review the three elements below for each material. This will help the team identify specific components that may need to be modified. The team may use qualitative research techniques like small focus group discussions or in-depth interviews with audience members, and/or insights derived from program staff experience to define adaptation needs. Determine whether the language and terms used are appropriate to the audience’s literacy level/ reading levels. Review text, narratives and captions for content accuracy, quantity of information and clear presentation of concepts, including whether they are presented in logical order. Determine whether wording is used appropriately and if it addresses the audience’s behavioral and socio-cultural barriers to change. Examine culture-specific statements and local idioms used; consider whether they are in the preferred language of the audience and used in the right context. Determine whether text complements visuals used (and not compete with it). Find out if the messages and the people communicating the messages are relevant, credible and attractive to the audience. Decide whether the visuals illustrate important points, are understood and will not confuse the audience. Determine whether the people and places in the visuals represent the audience and their culture realistically, and will be familiar attractive and acceptable. Decide whether the existing format—print, audio, audio-visual or interactive (like mobile and social media)—is likely to be effective in reaching the audience. Determine whether the design of the material is inviting, visually appealing and easy to follow, including fonts, typefaces and colors used. Decide whether the size and format of printed materials are appropriate and convenient for their intended use (often field tests are required to know this). Modifications may be minor, such as including a more culturally relevant image on a poster or brochure. Other times, a material may require more extensive modifications to make it relevant to the audience or setting, such as developing a “new” interpersonal counseling activity guide by compiling activities from several different guides. Assess whether sufficient time, staffing and financial resources are available to adapt the material or product and achieve the communication objectives. The cost and time involved in revisions can vary substantially. Text revisions are not likely to be as expensive or time-consuming as revisions of formats, images or illustrations. Revisions of audiovisual productions are particularly costly and will require more audience testing. Compare the cost of adaptation to what it will cost to produce new materials. If adaptation is extensive it may be as costly as developing new materials. Unless there is another compelling reason to adapt despite the relative cost, it may be worth developing new materials. Draft copies of written or audiovisual material. Rental of venue where material is tested. Incentives and transportation for participants and the teams conducting the concept test and pretest. Staff time for analyzing findings and writing reports. Contract with a full-service agency for payments of fees or salaries for writers, artists, actors, models, audiovisual producers and/or designers (varies based on the type of channel to be used, material format and extent of the changes). Cost of printing or producing the number of copies in the required quality. Cost of transporting copies and cost of travel to distribution locations. Explain the reasons for wishing to adapt the material. Outline how the material will be adapted (what changes will be made). Describe how and where the adapted materials will be used. Ask if there are any guidelines on how to give credit for the original material. Follow up the email with a meeting or call, if possible, to discuss in more detail. In any case, request written consent from the partner to adapt the particular material. Adapted materials should give credit to the original producer of the material. Some organizations have specific guidelines about properly citing the material. In some cases, certain logos and branding may need to be retained. NOTE: Partners can sometimes be protective of their materials, as they most likely have invested a lot of time and energy in developing them. They may require careful convincing. Be diplomatic and highlight the benefits the partner will receive. Others may be happy to have their materials adapted and used further. Once the program team has identified materials appropriate for adaptation, determined necessary revisions, verified that resources are available and obtained permission, materials can be adapted. Follow the same steps for adapting as for developing new materials (see creative brief and materials development guides). Develop a creative brief for each material to be adapted. Concept test and pretest the adapted materials. Revise and finalize the adapted materials. Produce and disseminate the materials. Before deciding to adapt a material or activity, obtain feedback on its effectiveness from the program that produced it and review evaluation data. Create an initial budget and timeline based on the cost of creating a new mate­rial or activity, and then eliminate items that will not be needed due to adaptation. Always start by analyzing the audience’s needs and listening to their perspective on what content will work for them. Find out if there is a local SBCC or relevant communication/ health promotion technical working group for the development of SBCC materials. Technical working groups often share materials and expertise. They are also useful for identifying partners with whom to collaborate during and after the adaptation process. Are able to write well in their native language. Have the necessary technical and cultural knowledge. Can translate for meaning (instead of a literal translation, i.e., word for word). Are experienced in writing for lower literacy audiences. Material adaptation can save time and money if the changes needed are not extensive, and can make high-quality materials available in new contexts. When adapting materials, a cost benefit analysis can help determine whether adaptation or new material development is the best option, given the needs of the priority audience and program timeframe and budget. Adapting materials requires following many of the steps used for developing original materials. Audience analysis is part of the inquiry stage in the SBCC process. It aims to identify and understand the priority and influencing audiences for a SBCC strategy. Behavioral and socio-cultural barriers include behaviors, cultural practices, social norms and societal structures that stand in the way of adopting or sustaining a desired behavior. Creative brief is part of the design stage in the SBCC process and guides the development of creative materials to be used in communication interventions. Creative team is brought together to develop creative messages and materials based on the creative brief. The team may include project staff, creative professionals, health communication experts, topic experts and members of the priority audience. Situation analysis is part of the inquiry stage and is the first step in the SBCC process. It helps to identify and understand the specific health issue to be addressed and provides a detailed picture of the situation. C-Change (Communication for Change). 2012. C-Bulletins: Developing and Adapting Materials for Audiences with Lower Literacy Skills. Washington, DC: FHI 360/C-Change. C-Change. 2011. Voluntary Medical Male Circumcision (VMMC) Communication Material Adaptation Guide. Washington DC: C-Change/FHI 360. National Cancer Institute. 2008. Pink Book: Making Health Communication Programs Work. Bethesda. Md: National Institutes of Health.